Naval Air Warfare Center Weapons Division Swarm View teammates Joshua Elroy, front left, Melvin DeBerry, back left, Christopher Yelton, back right, and Jeremy Siedschlag, front right, work on the unmanned aerial vehicles used for their Innovation Challenge on Oct. 18 at China Lake, Calif.
Two Naval Air Warfare Center Weapons Division teams, Urban Reconnaissance and Situational Awareness (URSA) at Point Mugu, Calif., and Swarm View at China Lake, Calif., wrapped up their projects for the Naval Air Systems Command’s second annual Innovation Challenge on Oct. 12. With six months to work and a budget of $25,000 to spend on materials, the teams presented two unmanned aerial vehicle-focused projects designed to help the warfighter see what they otherwise could not and give the warfighter the opportunity to focus his attention elsewhere. Point Mugu’s URSA team worked to reduce or entirely eliminate urban combat casualties using an unmanned aerial vehicle armed with a camera to gain situational awareness in GPS-denied environments. The UAV would then use advanced algorithms to provide the user with a high resolution, 3D Virtual Reality map in real-time. 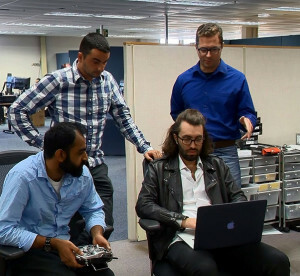 URSA team members were Michael McConnehey, Christopher Gudea, Shivneil Prasad, Georgi Ivanov, Cory Eighan, and Christopher Smith. 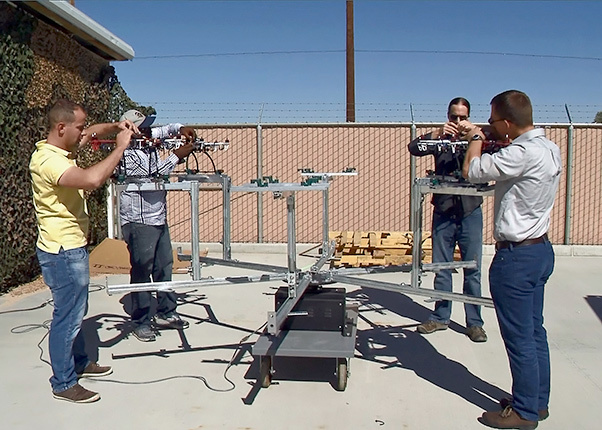 China Lake’s Swarm View team built a UAV platform to simulate autonomous swarm coordination using a mesh network to perform object registration within the platforms’ environment. The swarm of UAVs equipped with cameras enables the warfighter to review updated images containing objects of interest and provide information about the distance to that object despite the sensors and the object of interest being in motion in a cluttered environment. Swarm View team members were Jeremy Siedschlag, Melvin Deberry, Joshua Elroy, Christopher Yelton, Clayven Anderson and Nicholas LeBlanc. Naval Air Warfare Center Weapons Division Urban Reconnaissance and Situational Awareness teammates, from left, Shivneil Prasad, Georgi Ivanov, Christopher Gudea and Michael McConnehey test out the capabilities of the software and controller they used for their Innovation Challenge on Oct. 19 at Point Mugu, Calif. Despite the challenges each team faced such as losing team members, having to change methodology halfway through along with various fabrication and technical issues, both teams took their setbacks in stride and ultimately gained experience in project management, navigating the procurement process and exposure to working with a diverse team.